What is happening when students have questions about the history of their place? How Wikipedia can help them create and learn? What can they do in order to spread their knowledge to the world? These are some questions that Corfupedia is going to answer the following months. CorfuPedia is going to be a student project with main purpose to introduce students to Wikipedia, via creating new articles in the history of the place they live in. The project is going to take place in Corfu, Greece. A small island in the north western part of Greece. Corfu, is being mentioned from ancient times and many great personalities of the past, from Ulysses to Onassis and from Cervantes to Durrell spent many days of their lives on the island. English, French and Italians during their occupation of the island left great monuments that are still part of the living history of Corfu. The students of the cooperating schools, proposed the project to their teachers, since they have seen (after their introduction to Wikipedia) that there are not many articles referring to the local history of Corfu in Wikipedia. So they decided to create Corfupedia. A Wikipedia student project. Genuine new articles, high resolution photographs, hyperlinks (blue and red links) as well as graphs and tables are going to be gathered, organized, evaluated and published by the students. During the project, the students are going to learn the values of cooperation, creation, participation on a large project via applying their knowledge and research to a real project that is going to spread the main purposes of Wikipedia and the Corfiot history around the world. The students come from 2 Junior High Schools (Secondary education schools, with students aged 12-14), one evening High school (students aged 15-65! ) and one vocational evening High school (students aged from 16 to 38) and a team from the local, Ionian University (4 MA students with Phd candidates). The total number of students is 60. The project is going to take place during 2016-2017 school period from December to May. The aim is to cover the main articles of the local history of Corfu between 1815 to 1864 that the island was under British occupation. We hope that the project is going to be successful and we will come back to you with more information during its creation and at the completion of the project on May. Read more about the Wikipedia Education Program in Greece here. Snippet: Sivan Lerer (her Wikipedia hebrew username is: .סיון ל) is a teacher in the Hebrew University of Jerusalem. She led a successful Wikipedia project in the field of the Bahá'í Faith with the assistance of the chapter's team and one of the chapters volunteers, Darya Kantor. Can you give us a bit of a background on the course? The course I teach is introduction to the Bahá'í Faith. The course is usually given in the B.A program of the department is Islamic and Middle East Studies, or the department of Comparative Religion. The Chair in Bahá'í Studies is responsible for the course being given. It is a unique academic programme in the world. It's independent, but works with both departments. I've been teaching this course for the past seven years. It's an elementary course about the Bahá'í Faith. I usually have about twenty students in their second or third year of their B.A. The Bahá'í Faith is a small and relatively new religion. It was established in the 19th century in Iran and spread out from there. Despite its Iranian origin, it is considered to be a Western oriented religion. My students know the Bahá'í Temple in Haifa but not much more than that. We cover its history, ceremonies, and its calendar. I teach them about important figures in the history of the Bahá'í Faith. It originated as a group in the Shia Islam. I teach the differences between the Bahá'í Faith and other religions. We talk about how it differes from Shia Islam, for exampe the ideas of Heaven and Hell, the End of the world, and the place of women in society. The Shrine of Bahá'u'lláh near Acre, Israel - the most holy place for Bahá'ís. Why did you decide to have a wikipedia project? What did you hope for? The idea of letting my students write in Wikipedia was actually inspired by despair. I’ve told my students, for many years, that despite its many advantages (it's accessible and in Hebrew), Wikipedia's notan academic source and is written by people that are not qualified. I told them they can use Wikipedia in the beginning but afterwards they have to go to the Encyclopedia of Islam, or The Encyclopedia of Religions. But all my admonitions were in vain. They used only Wikipedia as their source. What's more is that the Bahá'í Faith is not covered well in Hebrew Wikipedia, or even in English. There's not enough information on these subjects that is free, available, and reliable. I think that if you have an online free Encyclopedia, and people use it as a main source of knowledge, then it better be correct. Mistakes can move through the generations and then they become impossible to fix. Also I wasn't happy with the level of writing in my students’ exams. I ask questions and the students just regurgitate my lectures. I can't teach them how to write better. That's not what I teach. I didn't know how this issue can be addressed. I heard from my brother-in-law, who teaches in Haifa University, that the students there have to write wikipedia articles for credit. I thought to myself, that's not a bad idea. It will enable me to add to this field in wikipedia, make it more reliable. My students will experience "active learning", look for sources and write and not just listen and then regurgitate. It will be a better reading experience for me, and it would give me an excuse to work with them on writing skills. I thought about it for a while, and then I decided to go for it. While working on the course’s syllabus, I contacted the National Library of Israel, which offers editing course in Wikipedia. That led me to Darya Kantor, an active wikimedian, and then to Shai, the Education program director of the Chapter. Together they gave me the support I needed to run the program. How did the process work? Is an academic course with writing Wikipedia articles similar to the regular teaching format? First I read a lot about the Baha’i Faith in Wikipedia. I was trying to estimate the situation. There were only few article and mostly on the founders. I made a list of needed new articles, and a list of articles that needed serious revision. Working with the community, (through the help of the Chapter) I made sure that all of the new articles I wanted to add were appropriate for Hebrew Wikipedia. In the beginning of the term, Darya Kantor gave us a lecture on Wikipedia. She did so with a lot of knowledge and enthusiasm. Then I asked my students to choose a topic from the list. A student from Canada had suggested his own topic, The Baha’i Community in Canada. I accepted it gladly. 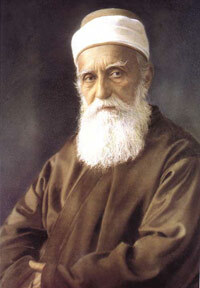 One of the articles that were expanded in Lerer's project is about `Abdu’l-Bahá', the son and successor of Bahá'u'lláh, the founder of the Bahá'í Faith. The course continued regularly. Students needed to read and prepare for the classes. In addition they needed to work on their Wiki article. Writing for Wikipedia is not like writing a paper. People will see what you write. So it was very important for me that the students are writing well. I set three milestones: The choosing of a subject, Writing an outline, and finding at least two good sources. I sat with each student separately and we checked every line, including the sources. After several weeks each student had a draft, first a basic one, later a completed one. Now we had a second session with Darya Kantor, to upload the drafts into Wikipedia in sandbox form. I went through them again and made my remarks. I set a deadline for the completion of the entries. I asked each student to email me when are they finished. I checked the editing logs according to the dates the students told me, in order to find the last version the student worked on. The students made the deadlines. I got all of the articles and checked them like I do my regular academic papers. I took into account that this is not a seminar paper or a research paper, where I would usually expect original research. This is a gathering and organizing information assignment (which is just as important) and so I didn’t look for new research, or creative ideas. I did insist on including good sources that would enable the readers to learn more, and writing in a clear and organized fashion. I insisted on links within Wikipedia, and to other sites in the acceptable manner in Wikipedia. I was patient with the students because I wanted them to have a good experience. If I was very strict, I would have damaged their learning experience. I gave them a chance to improve their grades if they wanted to. Some of them took that opportunity. This attitude is good for all of us and creates a Win Win situation. The procedure took a lot of resources but I felt like the students really learned from it. This addition made the course better-rounded. The students were very pleased. In the teaching survey of the course they said that it was a new, original, and interesting experience. They were glad to have a chance to learn more about writing. Lerer's students have joined a large group of students that experienced editing in Wikipedia during their studies in Isareli universities. This photo represents a parallel project from Haifa University. Including a writing assignment in Wikipedia, is a generally new experience. Naturally is will come with its own set of obstacles. Can you share with us some of your difficulties? The main obstacle was the quality of the writing. Technology today teaches students to write short messages, without any punctuation. When writing articles you have to use a more official language. I had students that are not native Hebrew speakers, and that added to the challenge. I couldn’t expect from them the same writing skills as the Hebrew native speakers. I was less strict with them. I fixed some problems without it reflecting on their grades. We also sat together often, thinking about how to word their work. Some students preferred a strict course with less options. And they didn’t like the gap between my lectures and what they had to write about. Other students saw that as a plus: The chance to write something meaningful and not just to get a grade. Some students added to existing articles. Some of these articles were short, and so adding to it is easy. Others already had some substantial content, and the students had a difficult time merging what they wanted with what it said in the entry to begin with. They moved paragraphs around and other wikipedians moved them back resulting in editing wars. That diminished from the writing experience. I wouldn’t recommend adding to existing articles, it requires differents skills, such as language editing. We had our share of frustration. A student asked me why are we bothering. But that’s to be expected when trying new things. The average student wants to get his degree and not always willing to try new things. Do you and your students feel satisfied with this project? In this project, 18 students created or improved 17 articles which are the basis for learning about the Baha’i faith. As a result, Hebrew Wikipedia has better content regarding the Baha’i Faith and I’m very pleased about that. These new articles are written well and I’m very satisfied when I see them. At the bottom of each entry appears the category and I can click on it to see if it grew. If someone wants to learn more about the subjects through Wikipedia they’ll be able to. That makes me very happy. I think it was a positive experience for the students. Instead of memorizing, they really learned. They acquired research tools and wrote something for the “real world”. Next time, I’ll be able to direct my students to Wikipedia and tell them that the articles are good (although they can always be improved). I feel like I was able to improve the quality of their writing. It was a byproduct but when I saw their writing was better, I felt a sense of accomplishment. It was a minor goal, but it meant a lot to me. Some students said they will continue to edit. After the workshop with Darya, we had another computerized session because I saw they wanted to improve the articles. One student uploaded her entry, sent the link to her family and said: “No one will read my work if I just did a test. But this people will read.” This sense of accomplishment will encourage students to continue. It’s a win win project: for the teacher, for the students, and for the general public. It’s part of our goal in The Humanities, to share and enhance to knowledge. Some of the articles that were written (in Hebrew): The Baha’i Holidays , Bahá'í administrative order and Martha Root. Wikimedia Israel is collaborating with a wide variety of Academic establishments in order to generate free content. Open science is on the rise: More and more scientists open up their scientific work for example by publishing papers open access or making their research data available under free licenses. In 2016, Wikimedia Deutschland and Stifterverband are piloting an Open Science Fellows Program. Its goal is to qualify researchers from diverse disciplines to apply instruments of open science to their academic work thus making it accessible and reusable for others. As part of the program, the fellows will have the opportunity to connect with experienced experts and practitioners and discuss both the benefits and the challenges of Open Science. In order to establish a community of practice, the program fosters exchange and networking opportunities. In the interest of bringing the concept of openness into science, the program addresses academic institutions and empowers fellows to act as ambassadors. The program targets researchers who are in an early stage of their academic careers such as PhD students, postdoctoral researchers and assistant professors. It aims to impart knowledge about the idea of Open Science, collaborative working methods as well as digital infrastructures such as the Wikimedia projects Wikipedia or Wikidata. In the long term, the Fellows Program wants to trigger social change and promote openness in academic research and teaching. The Fellows are currently working on their respective research projects, results will be presented in early march 2017 in Berlin. Synergies between public and academic institutions with the Basque Wikimedians Users Group have bore fruit starting on 25 September. The Basque Public University, the DSS2016 European Capital of Culture and the young Basque Wikimedians User Group reached an agreement for this autumn to launch the project EHU-Wikipedia 2016 located in the Donostia-San Sebastián campus in order for the students to make themselves operative at the Basque Wikipedia in an academic environment by creating topic relevant articles under the guidance of their professor. Enrolled undergraduates will be using Wikipedia as a platform for both training and community projection / knowledge diffusion. The deal reached by the agencies above includes an economic agreement by which the Basque Wikimedians User Group benefits as an organization, not on an individual basis. Upon successful completion, the course gets the student 1 academic credit. The first step inaugurating this optional course took place on 30 September and 3 October, when workshops were staged in the campus of Donostia-San Sebastián addressed to the students of Chemistry, Physics, Computing Sciences, Anthropology, Law, Architecture, Business School, Philosophy, etc. All three agencies involved in the project showed their satisfaction at the enrollment of the courses and development of the workshops to date. The workshops were conducted by Basque Wikipedians on a voluntary basis. The students working in small groups will then need to focus on a topic agreed with the professor, and build an article. The course is meant to address not only contents, but procedures and values, emphasizing the building process, its more technical aspects like syntax or relevant links, but also collaborative interaction. The final outcome of the assignment is due for delivery on 16 December, when they will be subject to assessment by wikimedians and the relevant professors. Wikipedia training at The University of Oslo. Snippet: For the third time, master’s students in Oslo have Wikipedia editing as a part of the curriculum. The fall of 2016 have been the third semester where Wikimedia Norway have giving Wikipedia editing training to master’s students in History and Archaeology. The subject “Communicating History” (Historieformidling), where students learn to share their knowledge through making podcasts, writing editorials and editing Wikipedia, has been a great success. The subject was started by associate professor John McNicol, who recently was named on of Norway’s top 10 lecturers. "Contributing to Wikipedia gives a professional confidence and leads me to check my own statements more thoroughly. It makes me a better student. Besides, it's fun to contribute to my field being presented credibly in an encyclopedia that's used this much." For us in Wikimedia Norway it is great to see that Wikipedia and higher education goes so well together, and we are currently working to give even more students this possibility to learn the joy of collaborative writing! GLAM Macedonia started a collaboration with the Museum of Macedonian struggle in Skopje, which results with starting a First Wiki Club in Macedonia. The first session and the opening event happen on 19th October 2016. After three sessions, we have 22 students coming from 4 schools from Skopje, all coming from different part of the city, most of them by bus, using their free time. We are going with "baby steps" for now, and we are struggling for computers there: first day we worked with only two laptop computers. After Violetova's appearance in one famous TV Show, where she spoke about Wikipedia and Wiki Club in particular, she asked audience for donation of used computers. Till now, we received as a donation 5 used computers (desktop), but only one is a set: with monitor, mouse, keyboard, and USB WiFi adapter. We hope that we will find a way to complete the other desktop computers. In media: TV Show "Jadi Burek"
This page was last edited on 22 December 2016, at 15:31.